These crate training dog tips will help your dog with both house training and behavior and will help her learn what is expected of her. A crate trained dog will have fewer behavioral problems and you will have a safe and happy dog. 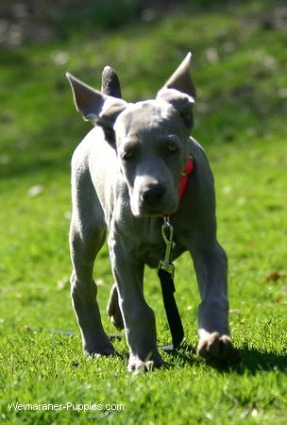 Dogs instinctively feel secure in a den-like setting, and your Weimaraner will quickly adapt to his large dog crate. If you have a new Weimaraner puppy, then crate training your puppy should begin the moment you bring your new Weimaraner pup home. 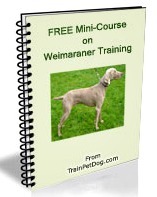 Crate training is a system of getting your new Weimaraner puppy used to being in your home and learning the rules. In the beginning, your puppy will spend most of his time in the safety and security of his crate. As he becomes accustomed to your routine, and he learns to do his business outside, your dog will gradually spend more and more time outside his dog crate–with you! Because a dog likes the safety and security of a cave-like setting, his dog crate is a happy place–as long as you provide water and toys to keep him amused. Some people believe that it is cruel to leave a dog locked up in a crate because they see it as a cage. However, even though a dog crate looks like a cage to humans, a dog is perfectly content in his own little space. If you choose a wire dog crate, your dog will still feel part of the family, as he can see everything that is happening! So crate training your dog is actually far more humane than some of the older methods of house training that used punishment as an incentive. In fact, crate training works better than punishment. and help her feel secure. Crate training a dog requires that you select the right size dog crate. Your dog should be able to stand up, turn around, and lie down comfortably in his crate. But he shouldn’t be able to stake out an area to be his bathroom. If a dog crate is too large, your puppy may decide that one side of his crate is the living quarters, and the other side is the bathroom. If you choose an oversized large dog crate, partition off part of the crate so your puppy can only access his “living area”. Crates come in various sizes and materials. They can be made of plastic, metal, or even wood. 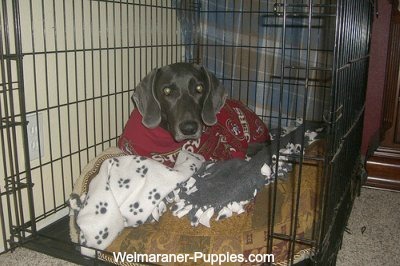 Regardless of what type of crate you purchase, it is most important for your Weimaraner to fit comfortably in his crate. Depending on your Weimaraner dog, this can be easy or difficult. Some dogs immediately acclimate to the crate. But others need a bit more reassurance. It’s important to take this process slowly, and to be very patient! Never force your Weimaraner into his crate. Doing so will only traumatize him and you’ll have a heck of a time ever getting him to go into his crate. There is a difference between the two! By house training your puppy you are teaching him not to go potty in your house. Crate training a puppy teaches him how to be calm and well behaved while in his own special space (his crate). Crate training a dog will definitely assist with house training. The reason for this is that puppies see their crate as their den. And instinctively they want to keep their dens clean. Dogs do not want to go potty where they sleep. It’s important to note that just crate training your dog is not the same as house training your dog. You must work on teaching your dog both of these things. Keep in mind that crate training a dog should be a happy experience for both you and your dog. I’m sharing all of my dog crate training tips with you because I strongly believe that crate training your puppy properly, is the best thing you can do for him, and for your home!